This article describes wood-enclosed metal chimneys, how a chimney chase should be constructed, and how those structures can be inspected for leaks, damage, or unsafe conditions. This article describes how to perform a visual inspection of wood framed chimney chases used to enclose factory-built metal chimneys for safety and other defects. Chimney inspection methods and chimney repair methods are also discussed. Our photographs show a typical wood-framed chimney chase constructed to house an insulated metal chimney and/or a Type-B gas vent. The photo at above left shows an incomplete chimney chase with poor workmanship - incomplete installation of housewrap, missing chimney flashing, and who knows what at the chimney top. Our photo at above right shows vinyl siding has fallen off of the chimney chase, permitting leaks into the structure. 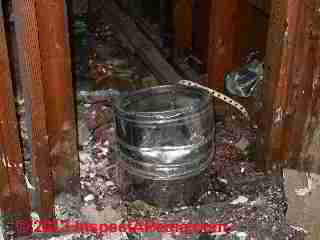 Below we show common leaky conditions at the top of a wood-framed chimney enclosure. The most common defect we find at wood-framed chimney chase ways is an improperly-constructed top flashing that is not sloped to drain properly (above left). Often people try to fix a leak at the the chimney top by smearing on roofing mastic (above right). We find that this is not a durable repair. A close-look at the top of a mastic-coated wood-framed chimney chase may show that the top is still concave, sloping in towards the chimneys and that the combination of heat and sunlight has dried and cracked the sealant. (Photos above). Because the top of chimneys is not readily accessible, leaks in this location may remain un-diagnosed for too long, risking insect damage, rot, and mold in the structure below. The result is leaks inside of the chimney chaseway where water may lead to a damaged and unsafe fireplace insert or heating appliance, rot, and insect damage. Our photo (left) shows how the interior of a wood-framed chimney chaseway may be constructed using common framing lumber and drywall. In this particular chase no chimney has (yet) been installed. But leaks at the top of this structure wet the drywall sides leading to a (hard to see) mold contamination. Watch out: before buying materials and starting to hammer away at constructing a chimney chase for your home, be sure to check with your local building code officials. A building permit is required in most jurisdictions, and the applicable building codes and inspections are important fire safety checks on your chimney chase design and construction. Dimensions for a wood framed chimney chase may be as small as 24" deep x 36" wide, but are more typically 3ft x 5ft x the necessary height to meet roof clearance requirements. Some builders frame the entire chase, beginning inside the structure (where for example a zero-clearance fireplace is to be installed) as wide as six feet to accommodate the fireplace insertion and to support a mantle. At our REFERENCES section you will find referrals to chimney construction & fire building codes. Framing nailing and structure is typically the same as structural wood framed wall construction in dimensions and spacing of framing members. Also see FIRE CLEARANCES, METAL CHIMNEYS. 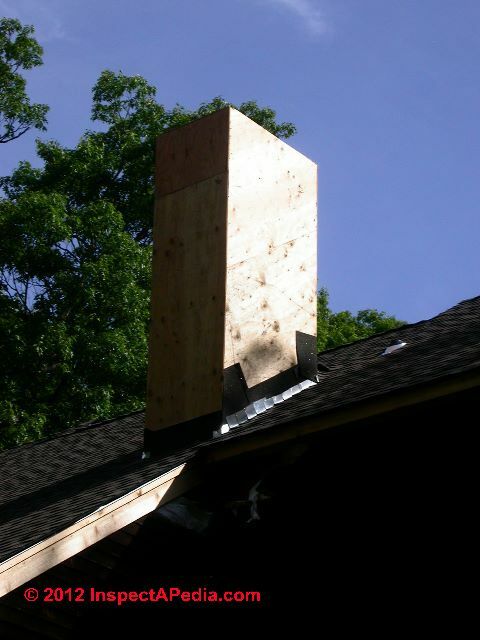 Properly framed and constructed, the portion of the chimney chase that extends above the roof surface at a height to meet the roof clearance distances will not require extra bracing. Framing the chimney chase: typically uses 2x4 structural members sheathed with OSB or plywood exterior building sheathing. For wind resistance, if the chimney chase is passing through the roof structure (rather than abutting the roof structure end, it should be framed continuously through the roof structure, not simply tacked on top of the roof sheathing. Take a look at the photo above showing the inside of a wood-framed chimney chase. Watch out: the chimney chase support at its base must be able to accommodate the weight of not only the structure and the chimney that may be routed through it (and its supporting brackets) but also the exterior siding (or stone) that may be applied. Extra supporting beams, headers, or a footing may be needed. 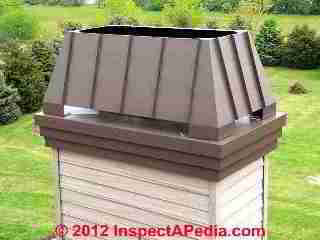 A chimney chase cricket is recommended between the chimney side facing the roof and the roof surface, otherwise you're asking for leaks in this location. In some jurisdictions (check with your local code officials) builders leave a one-inch space (see local and model building codes such as IRC code R1001.17) between the cricket edges and the chimney chase vertical side and similarly between the cricket and the roof deck. Assembly of the chimney chase: some builders construct the wood-frame of the chimney chase on the ground, perhaps in two sections depending on overall chimney height. By capping each section with solid plywood at each floor height, fire stopping has been added. Our photo (left) shows the remains of a metal chimney passing through the framed chimney chase enclosure as it passed through the first floor of occupied space in a building that suffered severe damage from a chimney chase fire. The factory-built insulated metal chimney was venting an oil fired heating boiler. Chimney chase fire blocking requirements: fire-blocking (perhaps 3/4" thick plywood or OSB (fire rated?)) is intended to slow or even prevent the movement of a chimney chase fire between building floors, and to prevent the increase of fire intensity and spread by the chimney effects that would occur inside the chimney chase without fires topping. Also see IRC 602.8. Fire blocking is also referred to as fire stopping or "fire stops". Factory-built metal fireblock shields may be required by and provided by the manufacturer of the metal chimney to be installed through the chimney chase. At CHIMNEY SHROUD FIRE we describe and illustrate serious fire damage caused by an unsafe and un-listed chimney top decorative shroud installed on a home in Moorpark CA. Chimney chase insulation - is not normally used; the fire rating and fire safety of the chimney will depend on proper selection and installation of the insulated metal flue that will pass through the structure. If for some reason you are insulating a chimney chase be sure that your insulation is kept back from the metal chimney itself in accordance with its instructions and fire codes. Securing the chimney chase: The chimney chase must be adequately secured to the building to withstand storms and wind loads for your area. Builders use steel framing connectors such as Simpson Strong-Ties™ to secure the vertical framing of the chimney chase to the building structural wall. Connecting the chimney chase sheathing to the building framing adds stiffness and support. The chimney chase top, (chimney chase cover) is usually metal, constructed of formed aluminum or stainless steel. We find leaks here especially where the top is framed and enclosed "flat" and the top flashing lacks adequate pitch and stiffness to avoid collapsing, even becoming concave" where there are snow loads. (See our chimney chase top photo at left). At the flashing between the chimney chase box and the roof and roof cricket - these leaks are almost always because someone was not careful to follow normal roof -to-chimney flashing detailing about flashing size, using step flashing and counter flashing. Do not rely on roof sealants and mastics instead of proper flashing. Through the chimney chase final covering: especially if faux stone or brick are used, but also if vinyl siding or other siding is not properly installed and sealed. Builders installing a stone or brick veneer often cover the entire chimney chase exterior with a stick-on flashing membrane such as WR Grace Ice and Water Shield. Watch out: for animals entering the chimney chase. A bird or squirrel nesting in the chimney chase is likely to create a fire hazard. Building owners or maintenance staff (such as at condominium complexes where many wood framed chimney chases may be installed) should inspect for evidence of squirrel-chewed openings in the chase sides, lost or open combustion air screens, and blown-off siding or chimney top seals. at CHIMNEY SHROUDS. Excerpts are just below. A "Chimney Crown" as popularly used in the fireplace industry may refer to a decorative top shroud installed atop a wood-framed chimney chase, as illustrated here. Steve Werner, a home inspector and chimney shroud installer with Chimney King , a custom chimney "crown" designer in Gurnee IL, provided us with the following wood framed chimney chase top pans along with comments. In the photo at above left, the top of the chimney chase was too small to allow for a decorative shroud to function safely according to our UL/OMNI test labs certification. We designed what we call a ‘super chase pan’ to increase the size of the top of the chase so a legal labeled shroud could be placed on top. At above right we can see the newly fabricated chimney chase top pan that has been corbelled out to increase its footprint or horizontal size dimensions to accommodate a decorative top shroud. In the fireplace industry we use the term “chase pans” for the covering at the top of a wood framed chimney chase. Our company, ChimneyKing, has bought lots of fireplaces, pipe, and made many decorative shrouds for testing in these labs to assure that our products are labeled and safe. Continue reading at CHIMNEY SHROUDS or select a topic from closely-related articles below, or see our complete INDEX to RELATED ARTICLES below. Or see CHIMNEY CHASE CONSTRUCTION FAQs - questions and answers posted originally on this page. 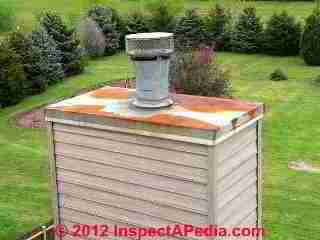 CHIMNEY CHASE CONSTRUCTION at InspectApedia.com - online encyclopedia of building & environmental inspection, testing, diagnosis, repair, & problem prevention advice. Baird, David J., C.B.O., "Factory-built Chimney Chase Fires: A case for More Detailed Inspection", Building Standards, March-April 1991, pp. 14-17. Stephen Werner, General Manager, Chimney King LLC., P.O. 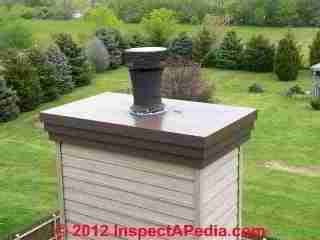 Box 8, Gurnee, IL 60031, Tel: (847) 244-8860, Email: steve@chimneyking.com, Website: www.chimneyking.com . Mr. Werner is also a licensed home inspector serving clients in Wisconsin. Chimney King sells their products through a network of fireplace dealers, chimney sweeps, roofers and builders. 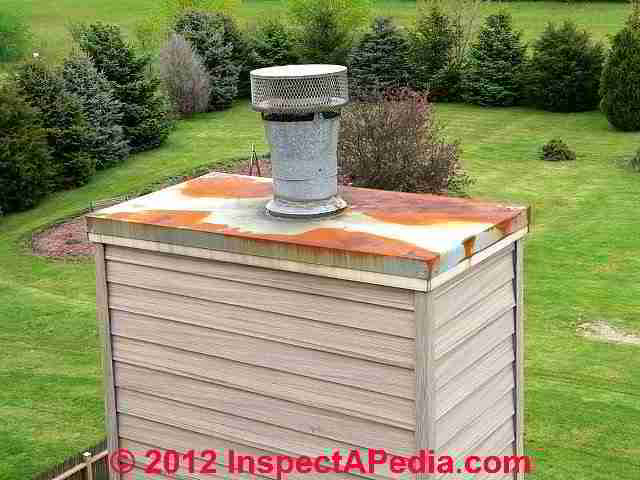 Each decorative shroud is custom built because no two chimney/chase are alike. Residential Masonry Fireplace and Chimney Handbook, James E. Amrhein, S.E., MIA, Masonry Institute of America, 2d. Ed., 1995, ISBN 0-940116-29-4. The MIA is in Los Angeles, CA 213-388-0472. This manual reflects the 1994 Uniform Building Code, Energy Conservation Requirements of California, and the U.S. Department of Housing and Urban Development - HUD. The complete UBC is available from the International Conference of Building Officials (ICBO), Whittier CA 310-699-0541. NFPA 211 - Standards for Chimneys & Fireplaces, NFPA 211: Standard for Chimneys, Fireplaces, Vents, and Solid Fuel-Burning Appliances, 2006 Edition (older editions and standards are found at the same bookstore), NFPA #211-3.1 1988 - Specific to chimneys, fireplaces, vents and solid fuel burning appliances. NFPA # 54-7.1 1992 - Specific to venting of equipment with fan-assisted combustion systems. GAMA - Gas Appliance Manufacturers' Association has prepared venting tables for Category I draft hood equipped central furnaces as well as fan-assisted combustion system central furnaces. Ceramic Roofware, Hans Van Lemmen, Shire Library, 2008, ISBN-13: 978-0747805694 - Brick chimneys, chimney-pots and roof and ridge tiles have been a feature of the roofs of a wide range of buildings since the late Middle Ages. In the first instance this ceramic roofware was functional - to make the roof weatherproof and to provide an outlet for smoke - but it could also be very decorative. The practical and ornamental aspects of ceramic roofware can still be seen throughout Britain, particularly on buildings of the Victorian and Edwardian periods. Not only do these often have ornate chimneys and roof tiles but they may also feature ornamental sculptures or highly decorative gable ends. This book charts the history of ceramic roofware from the Middle Ages to the present day, highlighting both practical and decorative applications, and giving information about manufacturers and on the styles and techniques of production and decoration. Hans van Lemmen is an established author on the history of tiles and has lectured on the subject in Britain and elsewhere. He is founder member and presently publications editor of the British Tiles and Architectural Ceramics Society. Also available at the InspectAPedia Bookstore. International Fire Code (IFC) (2000), IFC 603.6.3, 603.6.3 Decorative Shrouds. Decorative shrouds installed at the termination of factory-built chimneys shall be removed, except where such shrouds are listed and labeled for use with the specific factory-built chimney system and are installed in accordance with the manufacturers installation instructions. Reason: Decorative shrouds have been the cause of dozens of chase fires. As a non-listed part to a listed assembly, their use should not have been allowed in the first place. R1001.11 Fireplace clearance. Combustible material shall have a clearance of not less than 2 inches (51 mm) from the front faces and sides of masonry fireplaces and not less than 4 inches (102 mm) from the back faces of masonry fireplaces. The air space shall not be filled, except to provide fire blocking in accordance with Section R1003.12. 1. Masonry fireplaces listed and labeled for use in contact with combustibles in accordance with UL 127, and installed in accordance with the manufacturer's installation instructions, are permitted to have combustible material in contact with their exterior surfaces. 2. Combustible materials, including framing, wood siding, flooring and trim, shall be permitted to abut the sides and hearth extensions, but not the backs, of masonry fireplaces, in accordance with FIGURE R1003.12, provided such combustible materials are a minimum of 12 inches (306 mm) from the inside surface of the nearest firebox lining.